(Jan. 18, 2018) -- Chris Packham, associate professor of physics and astronomy at The University of Texas at San Antonio (UTSA), has collaborated on a new study that expands the scientific community’s understanding of black holes in our galaxy and the magnetic fields that surround them. “Dr. Packham’s collaborative work on this study is a great example of the innovative research happening now in physics at UTSA. I’m excited to see what new research will result from these findings,” said George Perry, dean of the UTSA College of Sciences and Semmes Foundation Distinguished University Chair in Neurobiology. Packham and astronomers lead from the University of Florida observed the magnetic field of a black hole within our own galaxy from multiple wavelengths for the first time. The results, which were a collective effort among several researchers, are deeply enlightening about some of the most mysterious objects in space. A black hole is a place in space where gravity pulls so strongly that even light cannot escape its grasp. Black holes usually form when a massive star explodes and the remnant core collapses under the force of intense gravity. As an example, if a star around 3 times more massive than our own Sun became a black hole, it would be roughly the size of San Antonio. 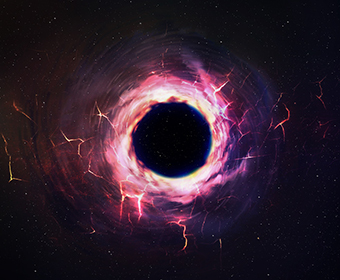 The black hole Packham and his collaborators featured in their study, which was recently published in Science, contains about 10 times the mass of our own sun and is known as V404 Cygni. As matter is broken down around a black hole, jets of electrons are launched by the magnetic field from either pole of the black hole at almost the speed of light. Astronomers have long been flummoxed by these jets. These new and unique observations of the jets and estimates of magnetic field of V404 Cygni involved studying the body at several different wavelengths. These tests allowed the group to gain a much clearer understanding of the strength of its magnetic field. They discovered that magnetic fields are much weaker than previously understood, a puzzling finding that calls into question previous models of black hole components. The research shows a deep need for continued studies on some of the most mysterious entities in space.